Yesterday we had a Tautog charter to the Chesapeake Bay bridge tunnel. The charter was a 5 hour trip. We left out of Vinings Landing Marina in Norfolk Virginia at 9 am. Our Marina is located about 3 miles from the Chesapeake Bay bridge tunnel. That is where most of our Tautog are caught from. 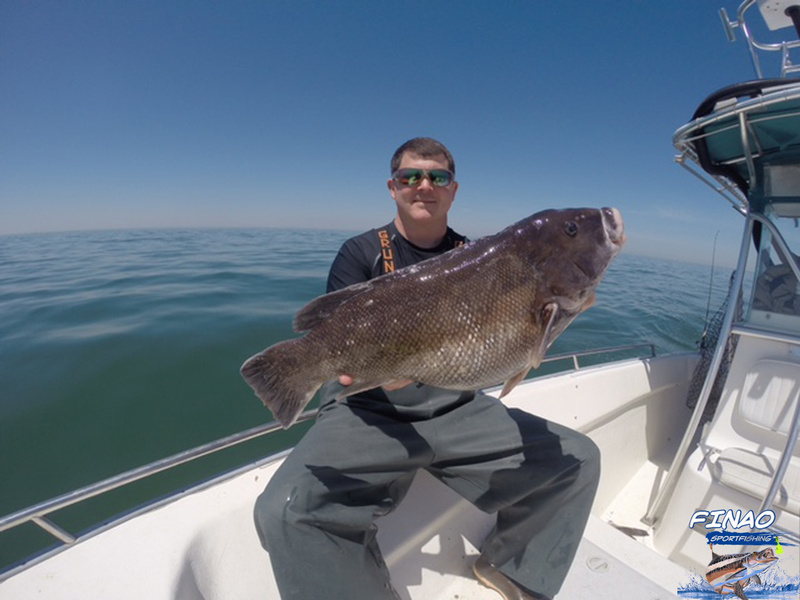 Click Here to book your Tautog charter today! Tautog fishing is excellent this time of year. They are active in the Chesapeake Bay in the colder months. Tautog are very structure oriented fish. They love to hang around Rocks, Pylons, and Wrecks. With Tautog being around structure Bridges make for great fishing. On our Tautog charter we do bottom fishing. These fish are usually swimming close to the bottom around the obstructions. Since you are fishing on a rough bottom it can be tricky to catch them. Using the correct gear is needed to successfully catch Tautog. On our Tautog charter we included all reels, rods, and tackle needed. Avet reels, Shimano rods, Power Pro braided line, and Owner hooks. This gear is top of the line and allows you to catch them with out worry. Tautog are powerful fighters even though they are not giant fish. The average size Tautog is about 4-5 pounds. When these fish are hooked there first instinct is to go back to the structure below. If they get back into the wreck or rocks they usually will break you off and escape! When fighting these fish we keep our drags set tight to not allow the Tautog to pull back into the wreck. On this Tautog charter we ended our day catching about 25 Tautog. Four of the Tautog we caught were over 8 pounds! Everyone on board went home with a lot of meat and some great pictures. Tautog season ends May 1st so be sure not to miss out on the awesome Tautog fishing the Chesapeake Bay has to offer! Watch the Video Below to see what it’s like to Tautog fish on Finao Sportfishing!